Apple's iPhone 5S and 5C might be all the rage at the moment. (Did you get a gold one??) But one college professor thinks smartphones should have a higher purpose. By "higher," I mean detecting things that are super small. Like microscopic. Aydogan Ozcan, an electrical engineering professor at the UCLA Henry Samueli School of Engineering and Applied Science, is the man with the crazy idea. His team at the school's Ozcan Research Group has been dreaming up all sorts of ways to use smartphones for medical reasons. The latest: Ozcan used a smartphone-powered microscope USB plug-in to detect human cytomegalovirus particles, according to a report from Fast Company. For those of us who don't understand medical speak, human cytomegalovirus particles can cause birth defects like deafness and brain damage, among other health complications. Ozcan designed and 3-D printed the microscope USB plug-in. It contains a color filter, an external lens and a laser diode, which essentially illuminates fluids or solids at an angle, producing a fluorescent image of the sample being looked at. Kind of like a hologram. For a smartphone and a device that weighs half a pound, that sounds pretty impressive. Ozcan published his findings on Sept. 9 in the American Chemical Society's journal ACS Nano. While reading this you may wonder what the real-world application for this might be, Ozcan explained his vision in a statement. 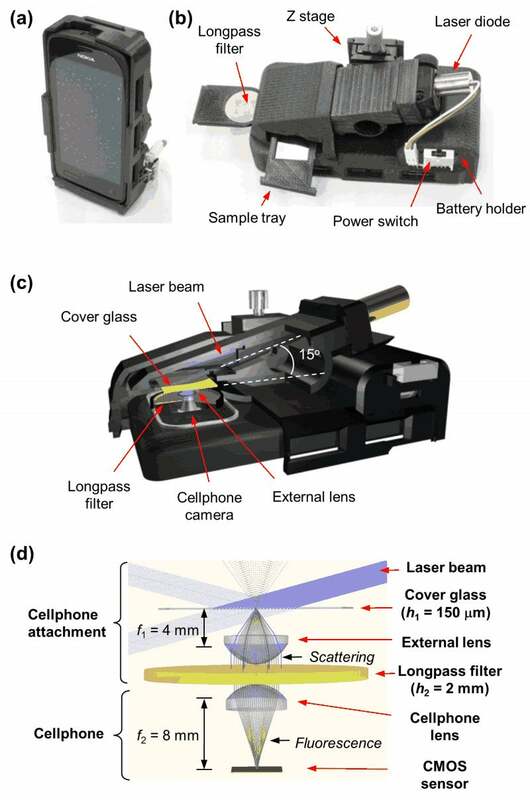 "This cellphone-based imaging platform could be used for specific and sensitive detection of sub-wavelength objects, including bacteria and viruses and therefore could enable the practice of nanotechnology and biomedical testing in field settings and even in remote and resource-limited environments," he said. In 2010, for instance, Ozcan was using another version of a smartphone-powered microscope to test for blood-borne microbial ailments like malaria. If it works like he says it does, that sure beats lugging around larger, expensive machines that do the same thing.